Hi my furiends! It's Cody!!! Hope you all had a great week and thankfully it is FRIDAY! Mom usually does the book features/reviews here, but today is special!! Mom is allowing ME to introduce you to a friend of mine, his name is Archie and he happens to be a MOUSE!!! Not just any ordinary mouse mind you, but a mouse that is made out of wool using a process called "felting." 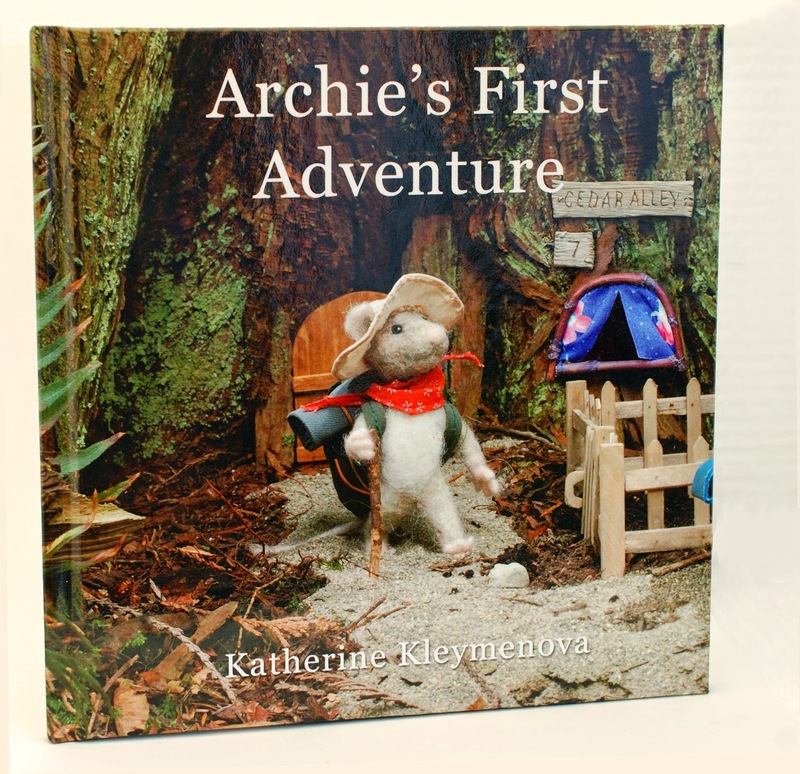 Archie and his book:Archie's First Adventure, were created by the exceptionally talented Katherine Kleymenova. Now, you are probably asking, "Why is a MOUSE being featured on your blog?" That is a purrfectly fair question my furiends! Those of you who are long time readers know all too well that this is far from the first time a MOUSE has been featured on my blog. Why? Because I LOVE MOUSIES!! My favorite toys in the WORLD are MOUSIES!! So anyway, back to my new furiend Archie!! Now sit back kitties and kindly purrmit me to give you some background info about this darling book! Archie the mouse, who lives in a little house under the big cedar's roots in the forest, has never been farther than Calm Creek. But when he receives a letter from his friend, Bruno, inviting him to visit for Christmas, Archie realizes it's time to do something very unusual - have a real adventure. Archie is a smart, curious mouse. He loves to draw and read books as well as play with friends. He is responsible but sometimes he can underestimate efforts and time properly. He likes discovering all the new things for him. Bruno is a lizard. For some reason he doesn't sleep in the winter time. Instead he moves to his winter house built on the top of Lilac Mountain, and spends this time hiking and skiing. He loves to travel, he has been in some strange places, climbed mountains using ropes, sailed in oceans, and even went down into the volcano's crater. 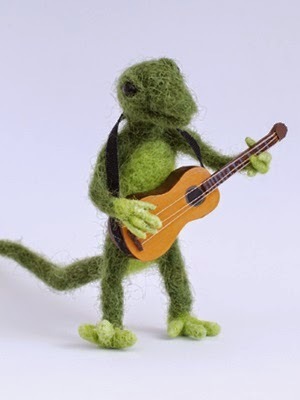 He also loves to play the guitar and dance. Furiends, Mom wanted me to tell you that the second she opened the book to read it to me she was smitten! You see, when Mom was a little girl she loved forests, and chipmunks, mousies, squirrels and other forest creatures. She STILL DOES! Mom also wanted me to tell you something that is super cool and educational about Archie's First Adventure. In the back of the book, author Katherine Kleymenova has a section that tells how the book was made. Polymer clay, fabric, wire and wood were used for many other things such as pens, teapots, cups and more. See the table lamp in the photo of me reading the book above? The table lamp has a real miniature electrical bulb inside and is plugged to the battery!!! Mom and I can't begin to tell you enough how much we enjoyed this book! Mom wants to share some of the magic from her childhood by giving this book to our great-niece this weekend. She is four years old and Mom is certain she will LOVE it! Hoping you will pawchase this book and share it with a little one in your life too, or donate it to a school, a library, a doctor's office or anywhere that there are little ones. They will LOVE IT! 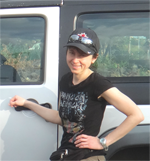 Katherine Kleymenova lives in Vancouver, in beautiful British Columbia, with her family. She has been working as a professional software developer for almost ten years, but she loves to do some crafts she enjoyed during her childhood. OMD how adorably cute and reminds us of our childhood. Have a fabulous Friday. me too! Hope your Friday was pawesome! Oh wow!!! This is super cute! What a fab idea to hand make the items like that too! I linked Cody to Feline Friday too. Oh it is!! Thank you! I was gone the entire day and didn't even get into email til about an hour ago. That was so kind of you! THANK YOU!!! Sending (((hugs))) and love! 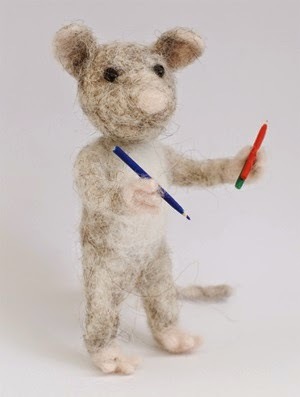 We have loved this "felting" craft since we first saw it on Mouses Houses blog.......this is every bit as incredibly fabulous as the other mouse world we're familiar with. The stories are sweet, the characters and backgrounds are amazingly creative - Mom and I think this is one of the most wonderful talents we've heard of - such lovely little worlds are creative with felting!!! That is too cute :) How creative. Please visit us , we have 2 giveaways- one for Easter and one for Passover. that is really adorable! reminds me of my milk toof.. Ohh!!! Are those little felted animals?? MomFOD started felting a bit. So cute! Love them. - Crepes. they sure are and in the book it even tells how they are made! I love them too, they are too adorable! That is an adorable book. The felted animals are so cute. It is even more adorable in person! I just love the "felted babies!!" It IS cute! I love it! You have great weekend too! Wes LOVES Katherine's art. Wes discovered some photos of her work last year! What a cool book! What an adorable book. It looks so well done. It is and it is just beautiful in person. I completely fell in love with the photos. It is just darling! That is one adorable book!!! That mousie is rockin it! I do too, she is so talented! What a fun and neat little book. I love "Mousie" too and you just look so adorable reading that story. So adorable, just so sweet! It's obvious why a cat, and a person, would love this book!